Attraction Marketing: Get Coaching Clients Online Just By Being You! Attraction Marketing: Get Coaching Clients Online Just By Being You! Ever felt like your marketing and branding posts get nothing but crickets? 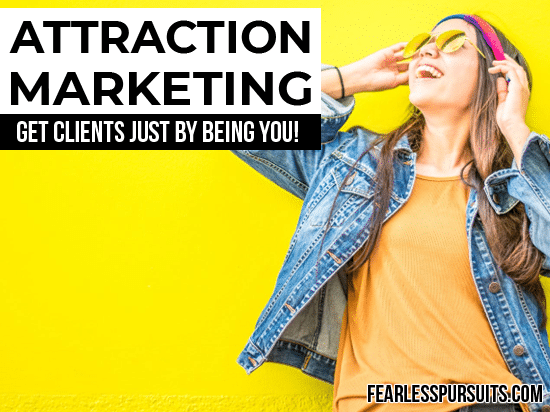 Attraction marketing could be the one thing missing from your strategy, and I’m here to explain it so your content never falls on deaf ears again! Now, look back in your mind to branding posts by other people that you’ve seen before. Don’t so many seem just the same?! How in the heck is one woman supposed to get visible if her posts fade into a sea of other posts by hundreds of other ladies offering something similar? First off, understand that just posting MORE isn’t the answer. So, what is??? What is your ‘USP’? This is your Unique Selling Point. Your zone of genius. Why you’re equipped to teach what you teach or help who it is you help. How can you CONNECT to your soul-aligned client? Think about the time when you were in HER shoes. Tell that story! Share how you became the hero of YOUR story and show her how SHE can do the same from where she is! You need to know what makes you unique and freaking USE it!! I know you’ve got it. Your background and everything it’s taught you. That one little area where you totally sparkle and shine in your process of helping someone. Beyond that, you need to create all of your marketing efforts around being R-E-A-L. Being real isn’t boring! THAT’S what people REALLY want! We don’t make lasting, close friendships by who we pretend to be. BFFs are people that love us for who we really are. And, frankly, what are our clients but friends first and foremost? When you embrace your truth in your message – flaws, quirks, silliness and everything that makes up you – some will reject it. You’re making room for the people who find it relatable, likable, and authentic to THEM. Beyond that… you can’t be afraid to take her on a walk back into the past with you. I know, it’s scary. Maybe even a little painful to think about. But, when you show her where you’ve come from to get where you are… you show her that she too can get there from here. Better yet, take her with you on the journey you’re on NOW. Hit a roadblock? Feeling low? Show her what you’re doing to get through it, so anyone in the same place can be inspired to do the same. You can’t find the few people who will LOVE you as long as you’re trying to be LIKED by EVERYONE!! You’re looking for the “Oh, she’s just like me!” factor, not the “Wow, she’s so perfect” factor. People are more excited if they can relate to you than if you can impress them. So be relatable, not perfect. Perfection is NOT a standard you can sustain anyway!! Don’t BS your peeps. Be you. Yeah, sure, some will be scared off… but you have to lose the right kind of people so that you can make room for the ones that can be affected by you the most! I’m a cheerful, in-your-face honest person, a Momma, a spiritual entrepreneur, and a total DRAMA QUEEN who wouldn’t have it any other way! MY own USP is my #Mompreneur status, my talent for dissecting a problem into super simple steps, and my love of incorporating mindset strategies into EVERYTHING I teach about marketing and business. What makes YOUR voice unique? Why do YOUR peeps relate to you? Let me know in the comments!